Any other part of the world, Graffiti is used as a form of vandalism, with some insolent 16 year old tagging any building they can find with their name/nickname/profanity. Whilst this artist is in no way the same league as Banksy, I still like the fact that they used the spray cans to spread good will amongst the residents of my local hangout, Al Nahda. Definately made me crack a smile after a long run at the local park. Just wanted to share with you all an email I received in my inbox lately. I'll just publish their initials to protect the innocent. I just came across your blog site, and became quite interested with it. I'm trying to figure out what to do with my life and the career of a Flight Attendant is one that really interests me. I have just one question - I currently suffer from a fear of flying, and I know this is going to seem like such a stupid question, but do you think there is still a chance for me to become a Flight Attendant? Do you ever get scared flying, what with all the news stories of planes going down and engines failing in flight? I would love to know what you think. Firstly, why do you want to become a flight attendant? Is it to travel? To see different places? To meet new people every day? To earn money? Every cabin crew I meet has completely different reasons for joining this profession, which is great - it just shows the diversity of the people who get into this profession in the first place. We come across passengers all the time who have a fear of flying. Most often than not it's not so much the flying they fear - it's being confined in a small space for many hours that they really dread. In these cases we just generally reassure them, check on them regularly and more often than not they arrive at the destination whilst managing to avoid being consumed by their claustrophobia. This isn't always the case however. I do recall a flight I did from JFK to Dubai, where there was a person so consumed by a fear of flying her piercing scream could be heard in the back galley. From the Terminal. Her parents had told her prior that they were going on a bus trip, and yes, she believed them. They dragged her on the plane, and the screaming didn't stop, until she was back in the Terminal 30 minutes later with her parents and 4 siblings and the baggage handlers were looking for their suitcases to offload. I'll tell you (and all my readers) something I've rarely told anyone. I have conquered a fear of my own through this job. I used to suffer from a fear of vomit, or Emetophobia as it's formally known, ever since I was about 8. I'm not talking about the dislike of it, because everyone dislikes it, but a full-blown fear. I remember as a teen my mother contracted some sort of virus which caused her to be very sick, vomiting 10-15 times a day until she finally acted on my advise to see a doctor. When I heard her retch, I'd be holed up in my room for a good 2 hours, firstly breaking out in sweats, then trembling/shaking, curling up into a ball with hands over the ears and tears streaming down just hoping for the entire ordeal to be over. Even to this day I still tremble when I come across it outside of work, and this fear is the main reason I often go 2 months without an alcoholic drink and why it took me 1 year and 5 months to visit a nightclub recently. So why become a flight attendant when there's bound to be motion sickness galore?!? Funnily enough though, when I step on board the aircraft the fear is just not an issue, and I've got no problem cleaning up the mess when someone gets airsick. You develop techniques to deal with the problem, such as breathing through the mouth, then covering the stain with ground coffee to mask the smell (I find if you see it, you can deal with it, but the second you smell it, you're and all the other pax are done for.) 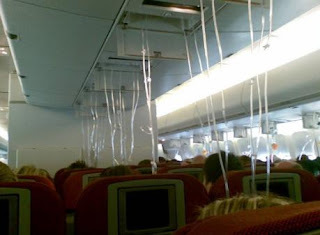 It's also great that there is a plentiful supply of airsickness bags, and everyone knows what they're used for, which you don't have in nightclubs, or public transport, or restaurants. Having said this, and let me make it clear... I do NOT recommend this career for anyone suffering from untreated Aviophobia. Aside from the very real chance that you may suffer an 'episode' on board like the girl did on the JFK/DXB flight, let us say you did get professional treatment, and travelled by air on a few holidays, and feel confident enough that you've conquered the fear, and you became a flight attendant. What if something went wrong? It could be a minor delay, a bout of turbulence, a medical emergency. But we've been trained to deal with far worse, and whilst decompression, engine failures and toilet fires are very rare, they would not train us to deal with these situations if they did not happen, and it could very well happen to you, on your first supernumerary flight, or after your 500th operational. In emergency situations, passengers will be looking to you for guidance, leadership and instruction. You must show that you are confident in that role, that you have the utmost faith in your pilots and your aircraft, and that you know exactly what you are doing and why you need to do it. You cannot show fear. If you doubt your ability to do this, then this job is not for you. To answer the last part of your question, I don't get scared at all when flying. I feel very comfortable watching Air Crash Investigation in my hotel room whilst getting ready to work the sector back. The only thing that scares me is that there might be a flight one day where a person has collapsed and I wasn't quick enough to get the oxygen or defibrillator to them. But thankfully that has never happened. Hey guys, hope you all had a wonderful Christmas and New Years - my holidays were spent in Paris and San Francisco respectively. Great cities but since it was the holidays many of the places I wanted to visit were closed :-( Fortunately the crew were great on both flights and for New Years especially I had a wonderful time ringing in the New Year in the crew room just chatting and having a very low-key party. And the best part was I didn't have to worry about how hard it was going to be to find a taxi back to the hotel and back to bed! So occasionally in this job you come across some slang terms that are used which are just comedy gold, and over the next couple of posts I'll feature some of the best on this here website. If you have any others to suggest feel free to leave a comment and it may end up in my next post! 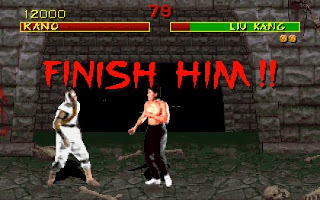 "Finish Him/Her" - Ever played Mortal Kombat? Street Fighter? I did, mostly from having a little brother (or my best mate Kris) equipped with a NES then a SNES at home, and needing someone to beat. In this game there was a point where the healthy character would be one punch away from a fatality, and the weak one was dizzy, swaying, mostly bloodied, and was basically lucky to be still standing. The same look could be said about a passenger, usually a little kid, who after experiencing extreme turbulence is motion sick, and has the same dizzy, swaying motion about him/her before they 'explode'. This is the universal indicator for FA's everywhere to either 1. Clear the area or to 2. Shove the person in the nearest toilet and pray that the lid of the bowl is up. Since hearing about this term from TrayTable, I have since saved myself from the vomit shower on 2 occasions simply by recognising the Finish Him/Her look. "Aisle Salmon" - A genius term I read of the news.com.au site. Someone who either during boarding or disembarkation tries to walk against the flow of the other passengers after forgetting or leaving something behind. There's one on every flight, and whilst I hardly see them anymore now that I work first class, sometimes if I help out Economy with their boarding we FA's try to pick out who the Aisle Salmon are. "Kevin" - A generic term for the little boy who is super annoying to the cabin crew and/or other passengers. Could be through being sick everywhere, through pushing the call button more than is humanly acceptable, asking for food items which are difficult to prepare onboard ie. cheeseburgers and french fries, or going to the toilet and peeing everywhere except in the bowl. 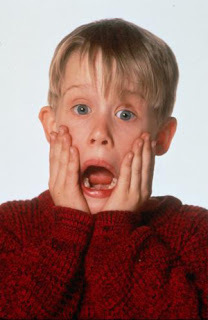 Name is taken from the Macauley Culkin character Kevin McCallister in Home Alone. "Galley FM" - Flight attendants gossiping about airline or other matters, or what rumours a fellow hostie has heard on board. Because if there's one thing we love to do, it's gossip. "Baggage Tetris" - Where you have a relatively full cabin, and there are a lot of large bags in the overhead lockers, and some on the floor, and you have to move them all over the place to make all of them fit, usually within a tight time frame for fear of delaying the aircraft. "Rubber Jungle" - A pilot term, for when the oxygen masks have all been deployed in the cabin, for whatever reason. Images courtesy of gamesyte, collider.